Medal success was celebrated in Eastern Europe by Ardrossan table tennis ace Ryan Henry. 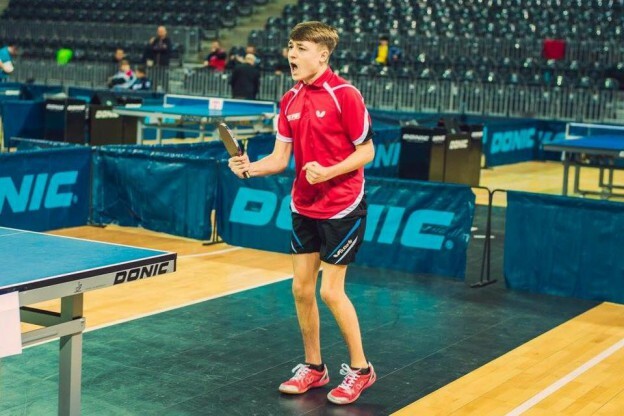 The 16 year old secured a bronze medal in the mens class 9-10 event at the Romanian International Table Tennis Open with team mate Shae Thakker. A victory against Russia took them through to the QF where Ryan beat Elias Monden to secure victory against a combined team from Germany & Luxembourg before the young GB pair lost their semi final to the eventual gold medalists from Italy and Denmark. Ryan said ” I was happy with the way I played and felt it was a great learning experience all round. I am really pleased to have won a bronze medal in the team event with Shae”.